The story thus far: Dante, a poet and town prior in Florence, finds himself on a dark road of the soul. Before his spirit can fall to its ruin, he encounters Virgil, the greatest poet of classical Rome. Virgil, at the behest of Beatrice, a woman who was Dante's inspiration in life, offers Dante a journey through the realms of the afterworld, through which Dante may find his soul's salvation. He shall travel through Hell, Purgatory, and Heaven, with Virgil as his guide through the first two. Dante accepts Virgil's offer, and they embark. After passing through the gates of Hell, they encounter the souls of the cowards who took no stand in conflicts between good and evil. After crossing the river Acheron, they enter Limbo, the realm of the noble or innocent souls who were not baptized or otherwise not believers in the Christian faith. 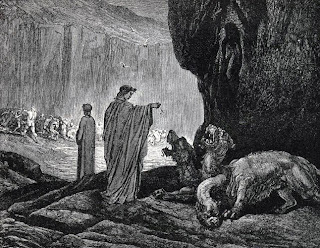 Dante and Virgil then travel to the first circle of damnation, reserved for the lustful. After encountering the souls of Dante's adulterous countrymen Paolo Malatesta and Francesca da Rimini, Dante faints out of pity. Or how I turn, and no matter where I look. Its nature and frequency never change. Pour through the gloomy air. The ground on which it lands is disgusting. Over the people submerged there. He claws the spirits, flaying and quartering them. The rain makes them howl like dogs. The unholy wretches turn themselves often. He did not have a limb that held still. Threw it into the ravenous maws. The souls with such force that they wished they were deaf. Upon their emptiness, which seemed to be their bodies. As he saw us passing before him. Making it seem as if I haven’t seen you before. Held me within its bounds during life’s serenity. For the ruinous sin of gluttony. As you see, the rain leaves me weak. For the same sin.” And then he spoke no more. So weighs upon me that it brings me to tears. Will, with a great deal of spite, drive the others out. With the power of the one who now hangs his head. Heads will be held high for a long time. No matter how much it cries or is dishonored. Two are just, and they are not understood there. Here he put an end to his tearful utterance. And make me a gift of continued words. Tell me where they are and in such a way that I know them. And he said, “They are among the blacker souls. Different sins weigh them down towards the bottom. If you descend far enough, you will there be able to see them. I pray you bring me to the memory of others. His eyes then went from focused to glassy. Falling with it to be among the other blind. When the hostile Judge comes. Touching a bit on the future life. The more it feels the good, and likewise the pain. They are, in this way, waiting to be more than they are now. Speaking of much that I do not repeat. We found, Plutus, the great enemy, therein.